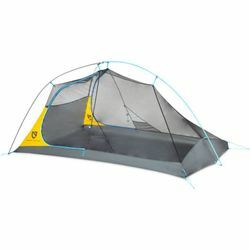 NEMO Hornet Elite 2P Ultralight Backpacking Tent. Hornet™ Elite is the ultralight tent of choice for extreme minimalists wanting the best in technical materials and design. Top shelf fabrics and a minimal pole structure shave every ounce possible, while our latest updates and new patent-pending Flybar™ volumizing clip adds even more room without adding any weight. Ultra-fine 7D Nylon Ripstop fly with silicone water repellent is extremely light and technical. Generous doors and vestibules for each person provide more coverage in the rain. Unique Divvy™ dual stage stuff sack makes it easy to divide the load with a partner. Patent-pending Flybar™ volumizing pole clip adds more room at the head and distributes fly tension evenly. Volumizing guyouts connect the inner tent to the rainfly, pulling the sidewalls of the inner tent outward to create more livable space. Black No-See-Um Mesh turns virtually transparent at night for clear stargazing. Triangulated volumizing guyouts at corners increase volume at the foot, protecting sleeping bags from tent wall condensation. Light Pockets™ turn your headlamp into a tent lantern through light diffusing fabric. DAC Featherlite poles boast minimal weight and connect with a single-hubbed intersection for lightning-quick setup.